It�s been a long time since an official update! I am currently working on a whole new re-vamped website, but for now here�s an update of some projects I�ve been working on. 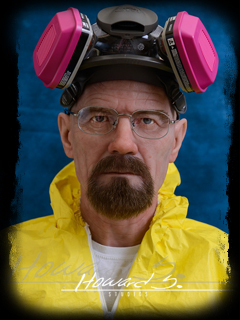 First up is a Hyper-Realistic 'Walter White� Bust from Breaking Bad, you can see more photos of him in the 'Adventure' Section. Then for a recent trade show I attempted to make a full tribute display for �John Carpenter�s The Thing�. Here�s a full torso of �MacReady� and a 'Blair Monster' in the works� be sure to check back often, since I have more �Things� in the works! You�ll find more photos of MacReady and Blair in the 'Horror' section. Next up we have a Teaser of a life-sized Chucky statue in the works, based on the final realistic Chucky at the end of 'Childs Play', here�s a silicone head for that project. There are more Chucky pics in the 'Horror' section. Since I�m so overdue for an update here�s a companion piece for the McFly piece I made years ago, a torso of 'Doc Brown' in hyper-realistic silicone! Check out the 'Adventure' section for more pics! In addition to these updates you�ll find pics of a New 'Evil Ed� Torso from the Evil Dead along with some pictures of my silicone �Blair Monster� in the 'Horror' section. That�s a few for now, stay tuned for a brand new website coming soon that will showcase some newer pieces!